Grado SR60i review | What Hi-Fi? Every time we get a bunch of headphones in at this sort of price, we're looking for a pair that will finally defeat the mighty Grados. It's not that we don't like them – quite the opposite, in fact, as you can see. But variety is the spice of life, and all that. Yet this is not the test in which the Grados get beaten. 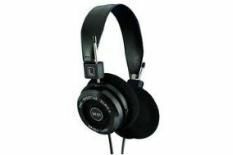 Like the Grado SR80is, and every other pair in Grado's over-ear range, the SR60is look like the headsets worn by radio operators of yore, or perhaps the ‘ear' bits of a Cyberman. That's not the only reason to avoid taking them out of the house: like their costlier siblings, they leak sound more than MI6 leaks top secret documents. But then the SR60is were never designed to leave the house. They're designed for serious, indoor hi-fi listening, and they absolutely excel at it. As long as you're not looking for ultra-deep bass, these will satisfy your every musical desire. They're tight, punchy and impeccably well-organised, ensuring the early snap of Crystal Castles' Empathy is the sonic slap in the face it's supposed to be, and that when the electronic effects build-up and the vocals are introduced, it's all cohesive, unified, and yet spacious at the same time. These headphones are dynamically agile, too, capable of reproducing the big dynamic shifts of an epic track like Time from the Inception soundtrack, but also adept at revealing the subtle waverings in Bonnie ‘Prince' Billie's vocal delivery on Wolf Among Wolves. Returning to the bass: some may crave a little more bottom-end extension, but the SR60is will go deep enough for the vast majority of people, and have low frequencies that are supremely tight and expressive. And if you still want more bass, you could just got for the SR80is, which are, amazingly, even better.